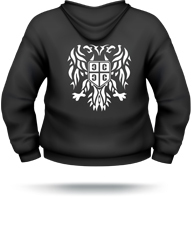 Front: Bog Cuva Srbe, Back: Made in Serbia Eagle: 12-oz, 100% polyester, Self-fabric collar, Set-in sleeves, Front zippered pockets, Partial 1x1 rib knit on cuffs, Tonal, full length coil zipper, YKK zippers with "ATC" auto-lock zipper pull, Reinforced topstitching throughout. Front: Made in Serbia Eagle, Back: Serbian Shield: 12-oz, 100% polyester, Self-fabric collar, Set-in sleeves, Front zippered pockets, Partial 1x1 rib knit on cuffs, Tonal, full length coil zipper, YKK zippers with "ATC" auto-lock zipper pull, Reinforced topstitching throughout. The shirt is form fitting, and is 98% cotton, and 2% spandex. Be one of the first to order this shirt! 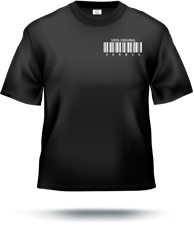 This is our official and original t-shirt design that sells out at every event. 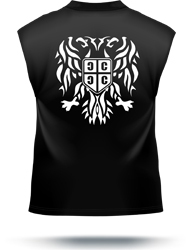 It has the Made in Serbia logo eagle on the back. This shirt is 100% preshrunk cotton. Order your official M.I.S.C shirt! 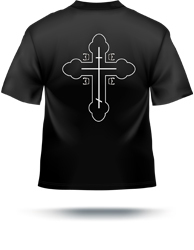 This men's t-shirt combines simplicity with boldness and is one of our most popular items. 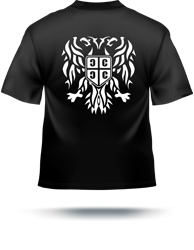 It reads "СРБИЈА" across the front, and has the Serbian eagle on the back. This shirt is 100% preshrunk cotton. This men's t-shirt has the Made in Serbia logo eagle on the front, and the Serbian shield on the back. It is 98% cotton, and 2% spandex. 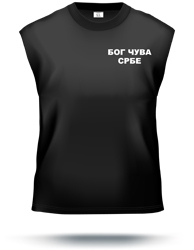 This men's "БОГ ЦУВА СРБЕ" t-shirt has a large Serbian cross on the back. This shirt is 100% cotton. This men's shirt is embroidered with the Serbian 4 C's. There is nothing on the back, and it's 100% cotton. Order your men's "КОСОВО ЈЕ СРБИЈА" shirt and make a statement. It has the Serbian cross on the back and is 100% cotton. This men's "БОГ ЦУВА СРБЕ" muscle t-shirt is one of our most popular items, with the large Made in Serbia logo eagle on the back. This shirt is 100% cotton. 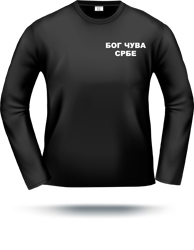 This long sleeve men's "БОГ ЦУВА СРБЕ" shirt has the Made in Serbia logo eagle on the back and is 100% cotton. "БОГ ЦУВА СРБЕ" is written across the front of this sweater, with the Serbian eagle on the back. It is 100% cotton and has no zipper. 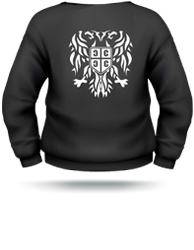 This men's sweater has the Made in Serbia logo eagle on the front, with the Serbian shield on the back. It is 100% cotton and has no zipper. 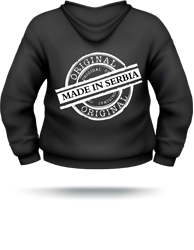 The "Made in Serbia - Barcode" hoodie. It is 100% cotton and has no zipper. 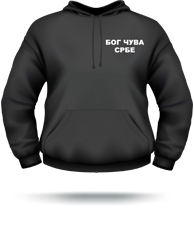 The ""БОГ ЦУВА СРБЕ" men's hoodie is our official and original hoodie that sells out at every event. 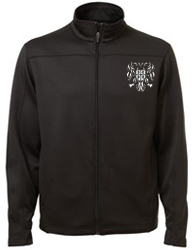 It is 98% cotton, and 2% spandex, and is not a zip-up. Order your official M.I.S.C hoodie! 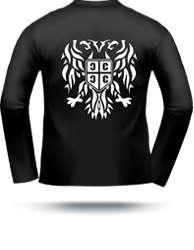 The Made in Serbia logo eagle is on the front, and the Serbian shield on the back. 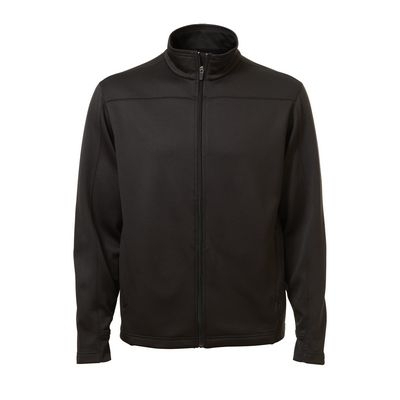 It is 98% cotton, and 2% spandex, and has no zip-up. 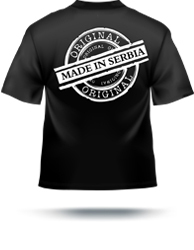 All orders over $100 before shipping and tax receive a FREE and complimentary Serbia flag. These images may not be exact representations as they are virtual images, please view the gallery for more images. 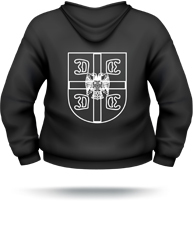 The process of printing on these clothing items is high quality screen printing. Please be sure to turn clothes inside-out prior to placing in the wash.
All orders are conducted online, through PayPal's secure online ordering system.